Trying to feed adults and an almost toddler can be a challenge for us, but gives me a nice excuse to push me a little bit. I LOVE quinoa and especially love that it is a complete protein without any additional help. Forming it into patties seems like a no brainer and makes for a perfect finger food for my 11 month old Max. What?! 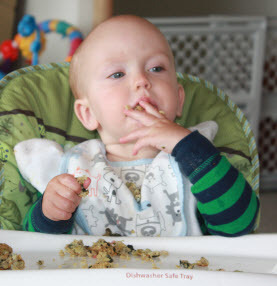 Don't believe me that an 11 month old would like to chomp on quinoa cakes? Ok, see for yourself then! Bring quinoa and water to a boil in a medium pot. Reduce heat to medium low, cover and simmer until liquid is absorbed, 20 to 30 minutes. Set aside off of the heat for 5 minutes, then fluff with a fork and set aside to let cool. Preheat oven to 400°F. In a large bowl, combine cooked quinoa with onion, garlic, veggies, basil, zest, flour, baking powder, egg, and pepper. Form mixture into eight (4- to 5-inch) patties and arrange on a baking sheet with a silicone baking mat. Bake, flipping halfway through, until lightly browned and just crisp, about 25 minutes. 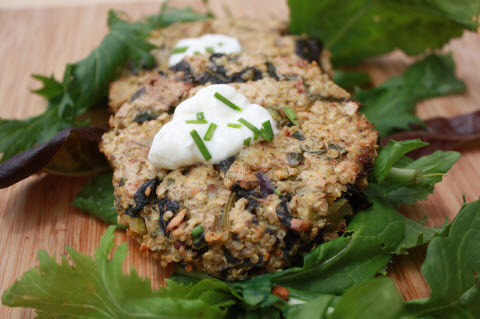 Stir together dill, yogurt and lemon juice in small bowl, then spoon over warm quinoa cakes.